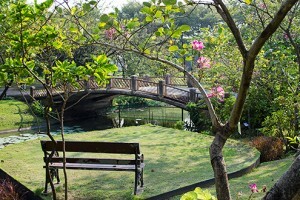 A popular activity when traveling to Chiang Mai is to visit an elephant sanctuary for a day. In fact, it is so popular that many new sanctuaries have been established over the past few years. Be warned however, not all sanctuaries treat the elephants ethically and you should do some research before picking any one sanctuary. We could write an entire post about the ethics of riding elephants during your trip to Chiang Mai. However we don’t need to because Amanda of A Dangerous Business has already written a post with four reasons why you shouldn’t ride elephants. To keep thing simple we will say it’s our opinion that you shouldn’t ride elephants for two reasons: First, an elephant needs to be “trained” for humans to ride them and unfortunately that process often involves torturing the elephant when they are young. Second, their backs aren’t built to carry the weight of a human (let alone two at a time!). While doing our own research we spent over two hours comparing each sanctuary’s website and referencing what they said with reviews on TripAdvisor. If we found references of riding the elephants or the use of tools, such as bull hooks and sling shots, we instantly took that sanctuary out of our consideration. 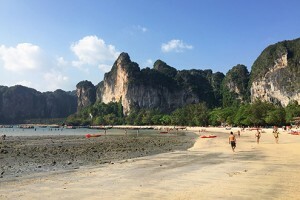 Our first choice was the Elephant Nature Park, which not only has thousands of glowing reviews, but has many positive blog posts written by other travel bloggers. However, when we went to reserve our spots we found out they were booked up for the next two weeks! Luckily, there was a handful of other sanctuaries that met our ethical requirements! To ensure we could get a spot we quickly narrowed them down to our top two, Elephant Jungle Sanctuary and Elephant Jungle Paradise Park. After emailing both, we ended up picking Elephant Jungle Paradise Park, as they were the first to respond with availability. 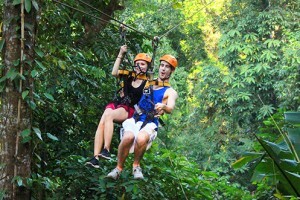 At first we weren’t sure what to expect from our trip to Elephant Jungle Paradise Park. While their reviews were positive, they didn’t have nearly as many as the other sanctuaries we looked at. However, we later found out that is because the sanctuary was established a year ago. Founded by a member of the Karen Hill-Tribe, the purpose for opening Elephant Jungle Paradise Park was to rescue elephants from riding and logging camps. 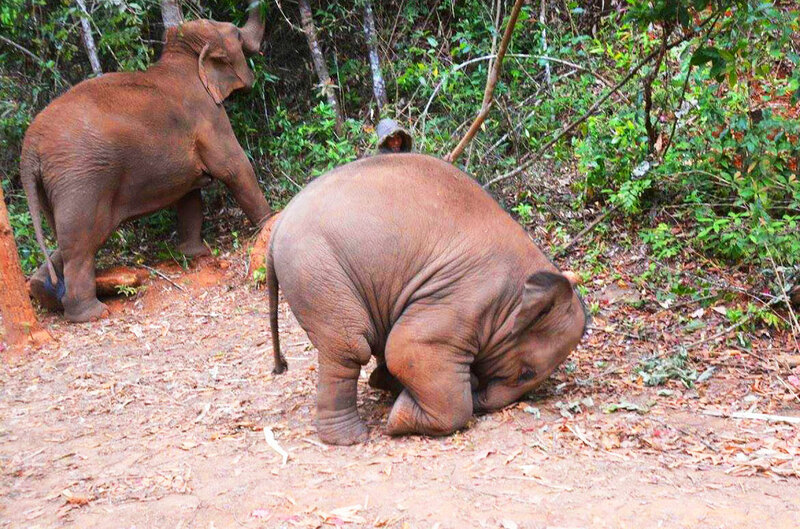 Today the sanctuary is home to six elephants, including a two year old elephant named Sun. 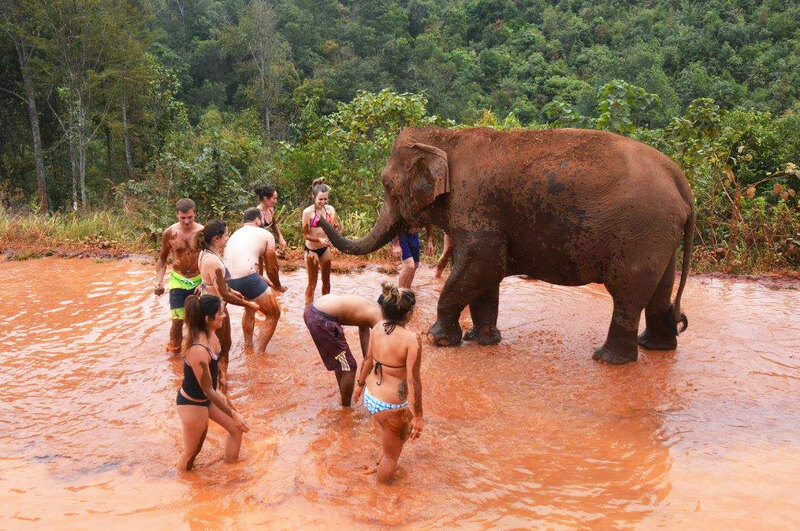 To keep up with the daily costs of rescuing elephants the sanctuary hosts small groups of tourists every day. 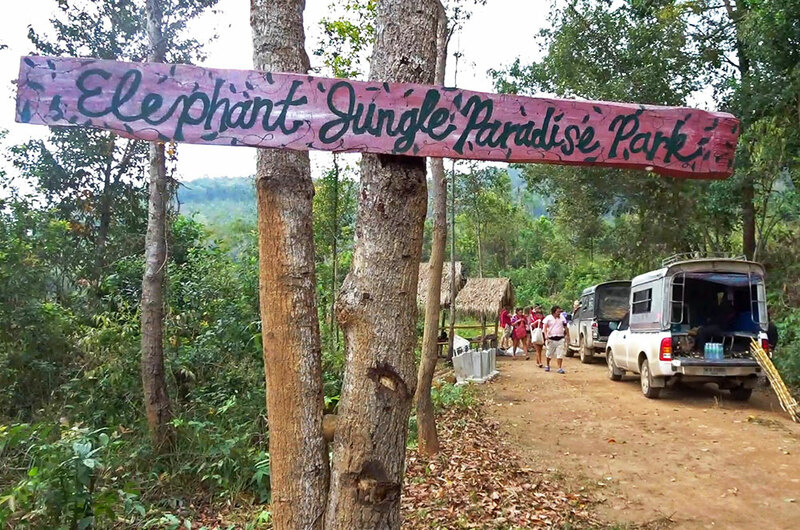 All in all, a day at Elephant Jungle Paradise Park costs 2400 Baht ($67.50) per person. This includes transportation to and from your accommodation, a traditional Thai lunch, and plenty of time to interact with the elephants. After providing them with the address of our accommodation earlier in the week, we were picked up from our hotel around 8:30am. 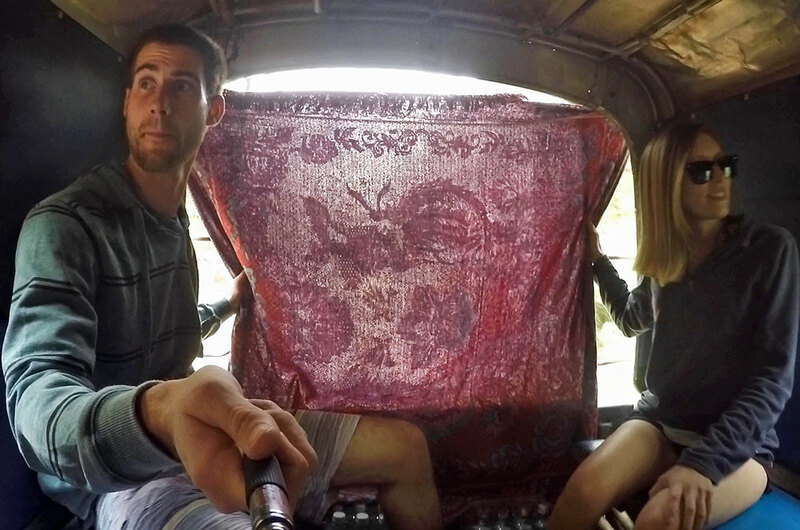 Rather than the vans we had become accustomed to in Southeast Asia, this time we rode in the back of an open-air truck. Similar to our experience during our day trip to Flight of the Gibbon, the ride to Elephant Jungle Paradise Park involved lots of bumpy dirt roads. Once the truck turned off of the main road, it was an up-hill battle to the top of the mountain which included nonstop twists and turns. Thankfully the Dramamine Brad and I took before leaving did its job – we didn’t feel sick at all. Upon arrival, we met up with the rest of our 12-person group and sat down for an introduction to the sanctuary. Machete, the main guide at Paradise Park, quickly got everyone pumped up while giving us the details of our itinerary (he is super upbeat and outgoing, I guess anyone who works with elephants every day would be)! After a short uphill trek, we finally met our first elephant! Machete gave everyone in the group a handful of sugar cane sticks and the feeding frenzy began. We each took turns feeding and rubbing him, everyone in awe of how gently he took the sugar cane from us with his trunk. Once every piece of sugar cane was eaten, he helped himself to some nearby leaves and went on his way. One of my favorite things about this sanctuary is for the most part, the elephants are free to come and go as they please. Next we walked deeper into the jungle to be greeted by MORE ELEPHANTS! This time there were three females and a two year old baby. At first we were all a bit nervous to be surrounded by such large animals, but as time went on we learned how gentle they actually were. We hung out with this group of elephants for some time. One elephant had been trained to kiss you on the face (you didn’t really have an option as to where) with a strong suction from its trunk! Definitely an unforgettable, and wet, experience. Secretly, we were all just vying for the baby’s attention. He would bounce from one person to the next, collecting as much sugar cane as he could. He would quickly overwhelm himself and drop all the pieces on the ground, but still throw his trunk towards you for more – so cute! He even “played” with one of our guides, but it was more like “run as fast as you can towards one another and stop.” Then he knocked over a little tree and ran around some more. He was basically the equivalent to a puppy in elephant form. After saying goodbye to the elephants for the time being we walked further downhill to a clearing with a waterfall and a couple of huts. The group sat down at a large table and got to know one another a little better before lunch was served. Somehow, within these tiny huts, a full course meal was prepared. There was fresh chicken, rice, noodle dishes, vegetables, curry soups, and plenty of fresh fruit. After lunch, we prepared some “medicine balls” for the elephants. Several natural ingredients, including roots and fruits, were ground together to make the medicine balls. 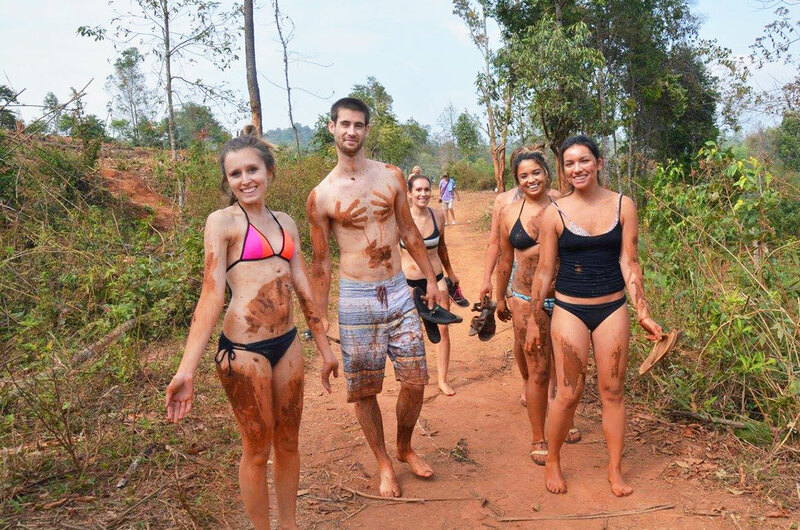 Once we were all done, we stripped down to our bathing suits, climbed back up the hill, and made our way to the mud pit. 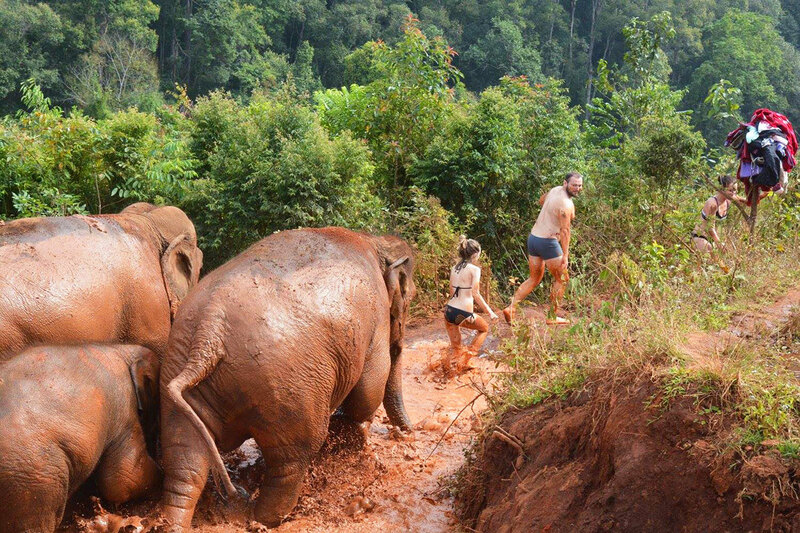 It wasn’t long until the elephants were trailing behind us, so we quickly took off our flip flops and waded in. The thick mix of mud and water (and probably some other brown things…) was more than ankle deep. 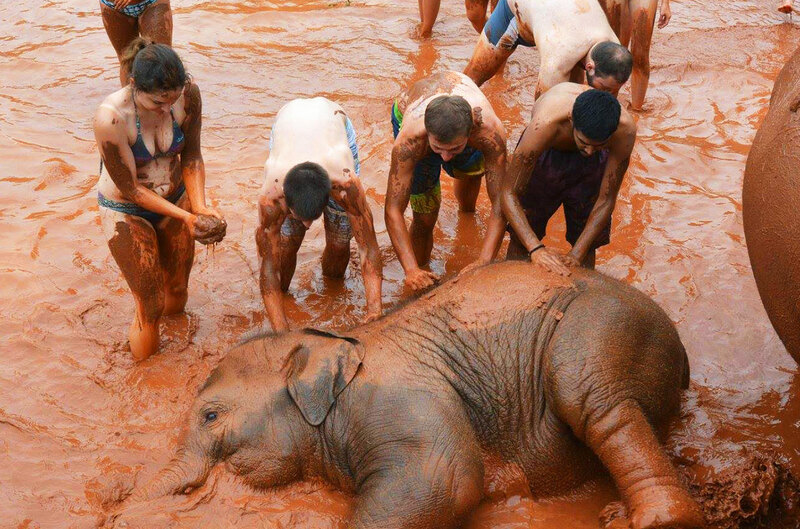 Machete instructed us to rub the mud all over our bodies, otherwise the elephants would not come near us. We all laughed when even after doing this, the elephants hesitated for awhile before joining us. Such suckers. 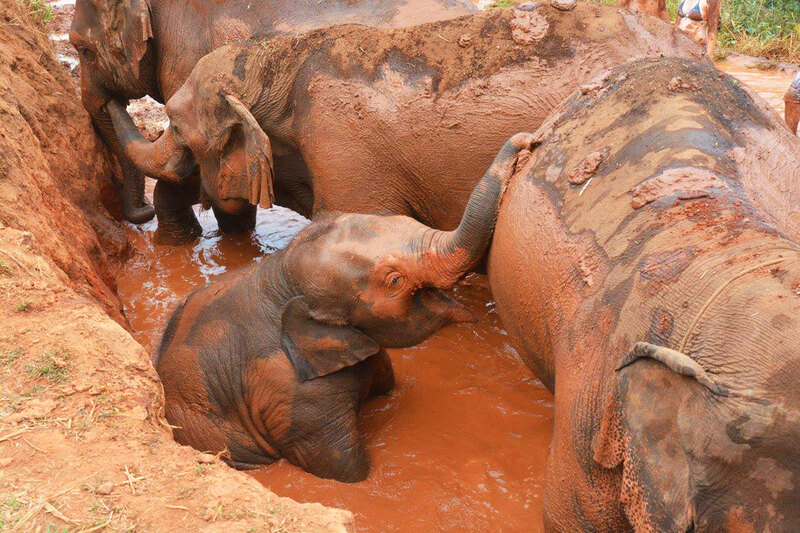 But soon enough we were no longer rubbing mud on ourselves, but instead the elephants! At first maneuvering around these giant mammals in the slippery mud was nerve-racking, but we all quickly got over our fears. They seemed to be enjoying themselves, as we rubbed mud on them as high as we could reach. 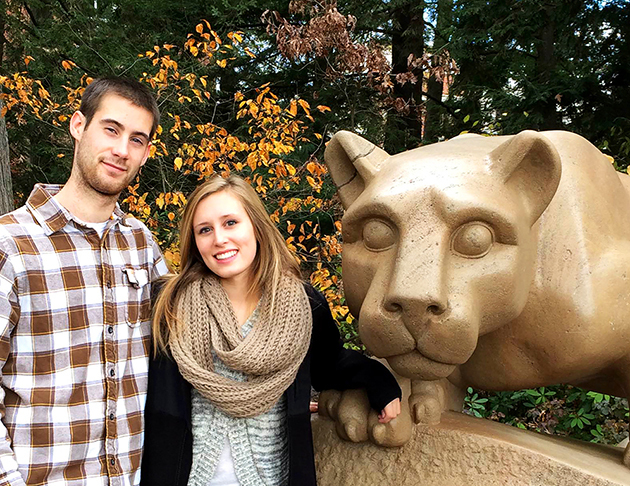 After having the time of our lives, it was time to get out. And the elephants made this very clear as the herd quickly made their way for the exit. The only problem was that I was standing in their way and had to run as fast as I could to get out first! After getting dirty, it was time to clean off! 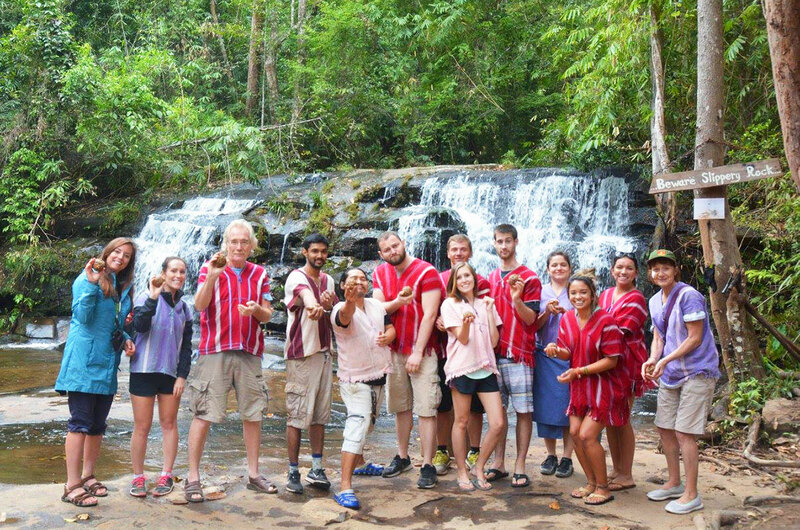 We all made our way down the steep hill to the waterfall with the elephants leading the way (they’re are a lot more agile going downhill than I thought)! 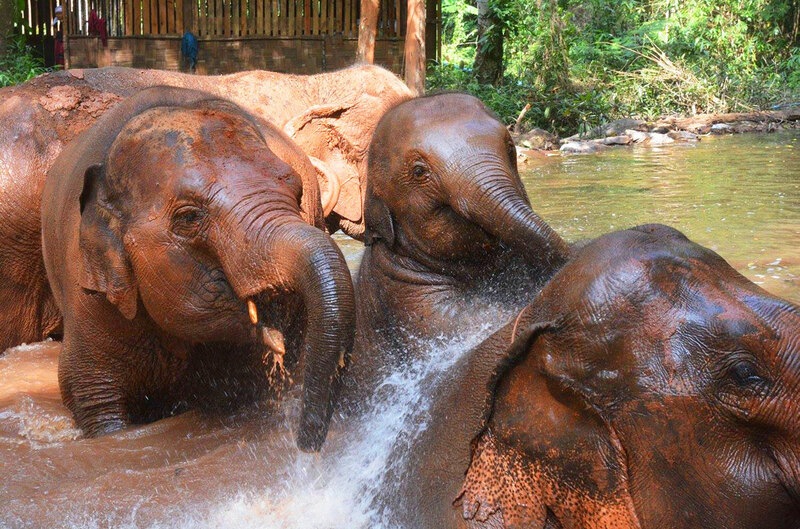 When we reached the waterfall each of us were given a bucket to splash water onto the elephants’ backs. Once they were cleaned off, we fed them our homemade medicine balls and got some more playing time in before saying our goodbyes. Next it was our turn to rinse off. Brad and I were the first ones to start washing underneath the waterfall, which was VERY cold. It took a bit of effort to get all of the mud off our bodies, but I can’t lie, my skin felt pretty smooth afterwards. Before heading back to Chiang Mai we were offered coffee, tea and some sweet treats. The group took its time chatting and saying final farewells before climbing into their respective trucks. This time we were too happy and exhausted to care about the bumps and twists on the way back down the mountain. Our trip to Elephant Jungle Paradise Park is definitely one of our top memories so far from Southeast Asia, we could not recommend it more! 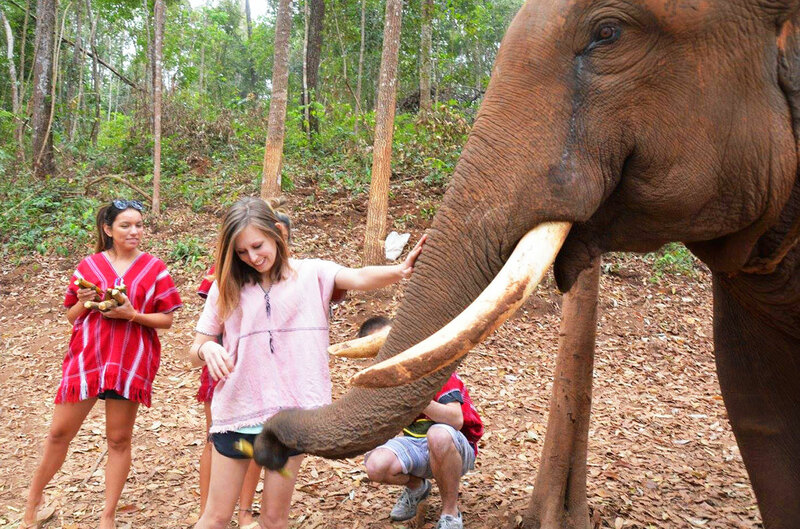 Have you been to an elephant sanctuary in Chiang Mai before? If so let us know how your experience was in the comment section below! 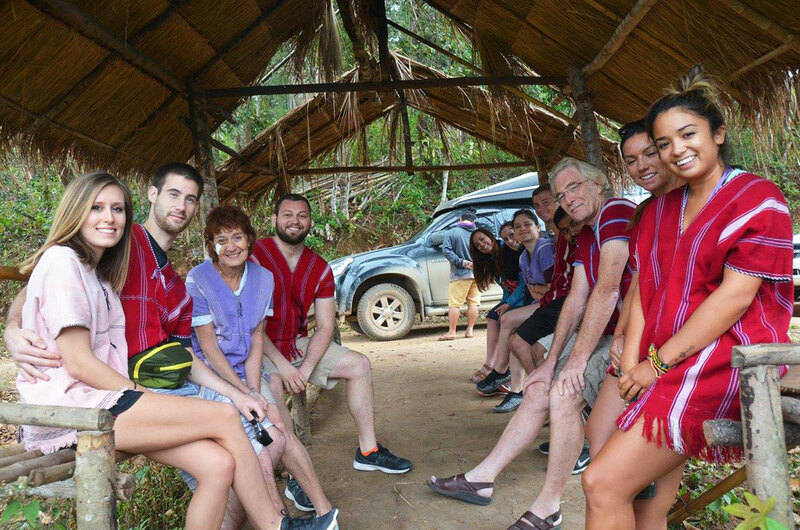 Your trip to the Elephant Park sounds very exciting… far different than anything you’ve ever done at Great Adventure in New Jersey your tour guide gave you a great day of fun and excitement and kept you safe all along the way! Wow!! this is a excellent trip of Elephant park, I love Elephant safari’s, Love to visit to jungle where i can make the trip of Elephant safari. Brad i got excited after getting this post, beautiful post lovely images both of you also..